Thank you, Virgil Ward, for making this a better world while you were here. May we all carry a little of your spirit with us throughout our lives. Virgil was a true Champion in life and fishing. God now has a great fishing partner. In 1999 outdoor media personality Dan Galusha, and photojournalist Brad Mosier finished two years of work in co-producing The World of Virgil Ward, which is a PBS television documentary about the life of Virgil Ward. Galusha and Mosier are multi-award winners in their respective fields, and put all of their knowledge, experience and admiration for Mr. Ward in to this project. It is from this documentary that the information and photos for this page have been obtained. Some of these photos did not appear in the documentary. At this point it must be mentioned that without the funding from Johnny Morris of Bass Pro Shops, Sam Johnson of JWA/Johnson Wax, and Wes Campbell of TTI Hooks, this documentary would not have been possible. That’s where we’re going to go. Just waiting to be explored. On June 25, 1902 William Sevier Ward married Pearl Florence Wright in Texarkana, Arkansas. After moving to Easton, Missouri the couple was blessed with a son, Virgil, on May 25, 1911. The business was traded in 1927 for a 120 acre farm, located 2 1/2 miles from Amsterdam, Missouri. His father purchased cattle at $300 each. The Great Depression hit, and the price of cattle dropped to $30 per head. Because of the move Virgil had to miss a year of school. In 1928 he started as a sophomore in Amsterdam High School. The family was extremely poor. Many times Virgil and his brothers and sisters didn’t attend school because they had to work. When Virgil did go to school he would walk the nearly three miles. His competitive spirit has shown throughout his life. While attending Amsterdam High School he was the county champion for three years in track. He was never beaten in any running or standing broad jump competition. He also competed in the discus throw and pole vault, and was the leader of the basketball team. When asked about his favorite subjects, Virgil jokingly says, geometry and girls. Maybe that is why he was called the “sheik” in a high school year book. Although Cleda Irene Thornbrough, who was called the “prettiest girl in school”, attended the same high school, Virgil did not meet her there. Their meeting took place during one of Amsterdam’s Band Concerts, of which there were one or two each week. The meeting eventually resulted in Virgil and Cleda’s wedding on December 3, 1933. Virgil was 22 and Cleda was 21. They were so poor that they could not afford a wedding photo. Their first child, Bill, was born in 1934. They also have three daughters, Barbara, Karen and Sandy, nine grandchildren and five great grandchildren. Virgil started a plumbing shop in 1950 in Amsterdam. To supplement his income he also sold appliances. The family lived in the back of the shop, which eventually became the home of the Bass Buster Lure Company. It remains as one of the Bass Buster plants today. It was through his appliance sales that he first met Coco Gregory who became his secretary, and still holds that position today. In 1955 Virgil and Bill started the Bass Buster Lure Company, and patented the fiber weedguard. This weed guard revolutionized the weedless jig, and is still used today by jig manufacturers. However, it was the feather jig that was the first big success of the company. After the feather jig came the famous maribou jig, and Beetle Spin. Later the company was sold to Sam Johnson of the Johnson Wax Company, who owned Johnson Fishing, now known as Johnson Worldwide Associates. Amsterdam is still the home of Bass Buster. It not only has the original plant, but also a new facility on the south side of town. Virgil’s athletic abilities and competitive spirit have carried throughout his life. He played basketball until the age of 38 and baseball until he was 48. 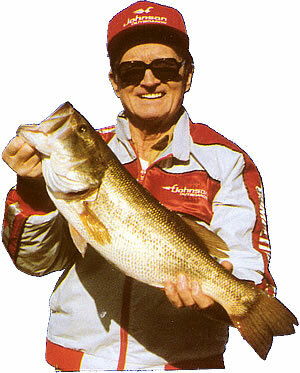 In competitive fishing he has won the 1958 Regional Bass Competition, 1962 World Series of Sport Fishing, 1964 National Championship of Fresh Water Fishing, and 1964 Outdoor Writers and Broadcasters National Fishing Tournament. According to his son Bill, this competitiveness and faith in God is what has carried his dad through many tough times, including his fight with bladder cancer. Some of his first experiences with the electronic outdoor media were with Lloyd Presley, who had a local outdoor show in Springfield, Missouri. Later Lloyd started Presleys’ Country Jubilee, which was Branson’s first country theater. Virgil appeared on Lloyd’s show reporting his fishing success in the area. Winning the 1962 World Series of Sport Fishing was the catalyst to Virgil’s television career. Pro Bass Angler, Charlie Campbell (left), discusses fishing with his long time fishing buddy, Lloyd Presley (right), during a break from interviews for the documentary at Presley’s theater in Branson, Missouri. It wasn’t long before Virgil was going strong in the outdoor media with a column in 455 newspapers, and a radio show on 200 stations. From 1963 to 64 Virgil hosted his first TV series with co-host Bud Iman, for the Missouri Conservation Commission. The shows aired on channel 3 in Springfield, Missouri. At this same time he also taught a fishing class at Southwest Missouri State University. This was the spring board for his most famous accomplishment – the nationally syndicated Championship Fishing TV Show. 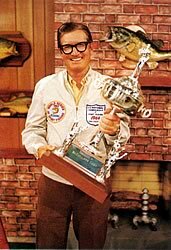 He hosted the show for 25 years, 21 of which took the number one rating for fishing shows, according to the Nielsen and ARB rating services. One of those years the show placed number one over 400 syndicated shows – one of his proudest achievements. The show’s longest running sponsor was Bass Pro Shops. Ranger Boats spent more money because of buying two spots per show. Another old sponsor was Johnson Fishing. Sponsors such as Johnny Morris of Bass Pro Shops, Forrest Wood of Ranger Boats and Sam Johnson of Johnson Worldwide Fishing/Johnson Wax, had a much closer relationship with Virgil than is expected with sponsors. They were actually friends. 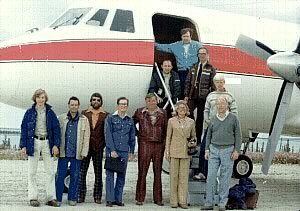 This same friendship carried over to his guests, whether they were professional anglers like Roland Martin and Charlie Campbell, country entertainers like Roy Clark, Dotty West, Junior Samples, Box Car Willie and Mel Tillis, sports celebrities like Pete Rose, Stan Muscial, Darrel Porter, George Brett and Wayne Gretzky, entertainers like Nanette Fabray, Hugh Obrien, Fred McMurray, Glenn Ford and Marty Milner, guides such as Jim Rogers (trout angler from Bennett Springs, MO), outdoor writers, or everyday people. Some guests were family members. His daughter Sandy, son Bill and grandson Greg appeared on several shows. Please click here to view our photo gallery of Virgil Ward television guests. Virgil’s guests never went hungry. His boat’s storage compartments were always packed with plenty of food. In the left photo Virgil and Dan Galusha enjoy their lunch on Bull Shoals Lake, while on the right, Virgil, Greg Ward and cameraman Spurgeon May search for Greg’s lost Reese’s Peanut Butter Cup. The show took Virgil on travels throughout the world. Many locations having breath taking scenery, some of which are seen in the documentary. Virgil feels one of his best shows was a trout episode shot in Alaska at Golden Horn Lodge. He said the fishing was fantastic, with at least a five pound fish on every cast. Bill Ward and his son Greg have followed fishing careers as well, although Greg’s has led to guiding in fishing and hunting in Alaska. Another grandson, Jeff Ward, holds the all-tackle World Record for the Arctic Char. This fish was caught on July 29, 1981, during a filming trip for the Championship Fishing Show, but unfortunately was not caught on tape. Other people who have worked with the show as cameramen were Larry Wood, Spurgeon May and Tony Holden. Many of the people in the outdoor media have had their careers influenced either directly or indirectly by Virgil. One such person is Al Lindner of In-Fisherman. After taping a show in Minnesota with Virgil, Al and his brother Ron decided to purchase a camera and start their own show. Al tells about this turn of events in an interview within The World of Virgil Ward, as well as making a special salute to the grandfather of fishing shows. At the end of each program Virgil demonstrated lures in a fish tank. Not only was this popular amongst viewers, but also profitable for the companies whose products were shown. Today the tank sets quietly in his editing studio being used as a fish aquarium. Dan Galusha, co-producer of The World of Virgil Ward, says his career has a direct link to Virgil’s advice. From an answer to a simple fan letter in the early 70’s, Dan received the advice to find a job as a tackle sales representative. Later he was told to try writing, which started him in newspapers and magazine, and then the ultimate opportunity arrived with invited to be a guest on the Championship Fishing Show. This lit the fuse for Galusha to head his career towards radio and television. Throughout Virgil’s life there have been numerous honors bestowed. He is a member of the Ozark Fisherman’s Hall of Fame, the International Fishing Hall of Fame and the National Fresh Water Fishing Hall of Fame. He was the recipient of fishing’s highest recognition, the Dolphin Award, and was included in the Living Legends of American Sportfishing. Today you can still find Virgil working in his old editing studio dubbing tapes for old friends. However, most of the time you will find him fishing closer to home. He enjoys outings on his private lake, trips to Bennett Springs State Park with his grandson Eric and daughter Sandy, and a short drive to fish Truman Lake with his son Bill. No matter where he fishes you can still see the intensity and concentration being applied to the task at hand. Virgil’s advice to future generations is to practice catch and release,and show a great respect for nature. Virgil Ward was a pioneer in many things. He taught us the importance of catch and release, and the proper way to dispose of our old fishing line and trash. This was long before either of these issues were popular subjects. What’s more important Virgil is an excellent role model. He is one of the nicest, and most honest people you could ever meet. What makes Virgil so popular with his audience? It’s his ability to transmit his personality and friendship right through the television screen, and then if you have an opportunity to meet the man, you will be meeting that same person. Thanks Virgil for making this a better world. Let’s keep the World of Virgil Ward alive forever. Bassin’ USA would like to extend our appreciation and thanks to the Ward Family and Dan Galusha for their time and gracious help in the content gathering and design of this section. Marques has grown up in the fishing industry all his life , now at the young age of 27 he is credited as one of the most knowledgeable young anglers in the Chicagoland area! Marques has worked seminars both big and small all over the area! This young gun angler averages over 100 days on the water fishing the entire State of Illinois and the Great Lakes Region. Marques has also made a name for himself in the tournament ranks! A 4 year pro on the WAL-MART BFL (Great Lakes Division), as well as many other State and Regional Circuits. I started Bassfishing at age 9 on the South Carolina home of my Aunt in Summerton South Carolina. During those years most of my fishing was done wading on the waters of Santee Cooper, mainly Lake Marion and other small waters in the area. I would fish from shore walking and wading almost every weekend and any day I could. I would try to target Bass but would fish for and catch almost any thing I could catch, including a 55 pound Blue Cat fish, Crappies, Bream and many 20 pound Carp. 43 years old. Married for 23 years to Julie, with two daughters Abby and Katie both of his girls in college. Don grew up in South Kansas City and was very involved in the outdoors at an early age. He began in the cub scouts and worked his way into the Boy Scouts and went all the way to Eagle Scout along with his two older brothers. Don’s parents thought it would better to keep their boys active in outdoor activities and out of trouble.